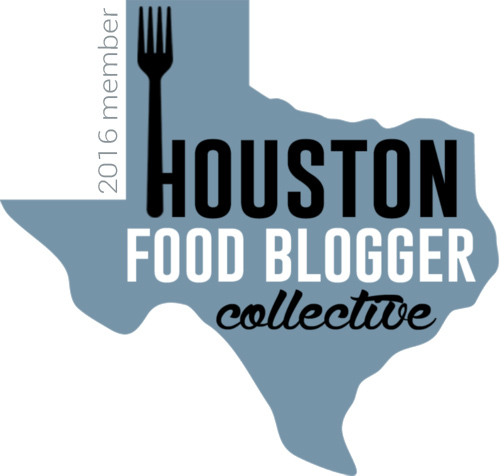 This post was done in partnership with Seasons 52 in Houston, who provided me with my food and drinks, free of charge. I was not monetarily compensated for writing this restaurant post. All opinions are completely, 100% my own! Whaddaya say we crank up the Mariah Carey Christmas, bust out our best mock turtle necks, take a break from all the cookie-baking, and go out for some deee-licious food?!?! 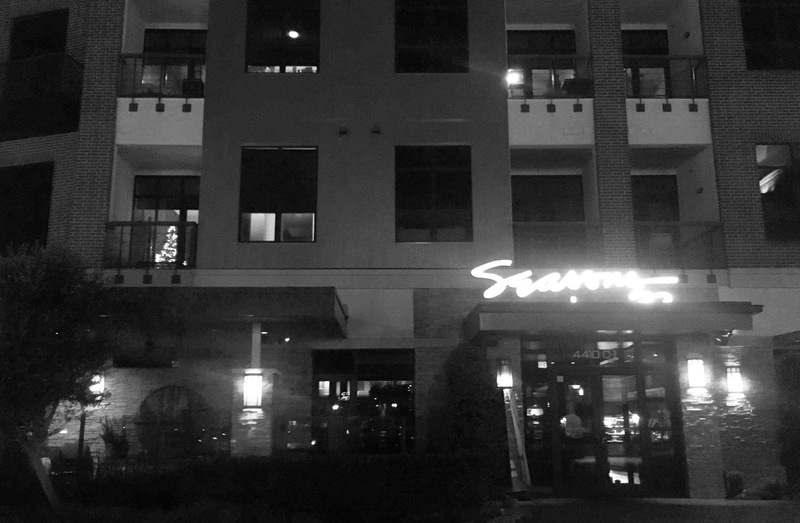 A few weeks ago, Jon and I were invited to try the winter menu at Seasons 52. The restaurant has two Houston locations, one in City Center and one near the Gallaria/River Oaks (where we ate). We've been to the restaurant a couple of times (read about it here, and here), and we had such good experiences both times, that of course we were thrilled to go back! As the name implies, Seasons 52 changes its food with the seasons, or "What's Good Now." 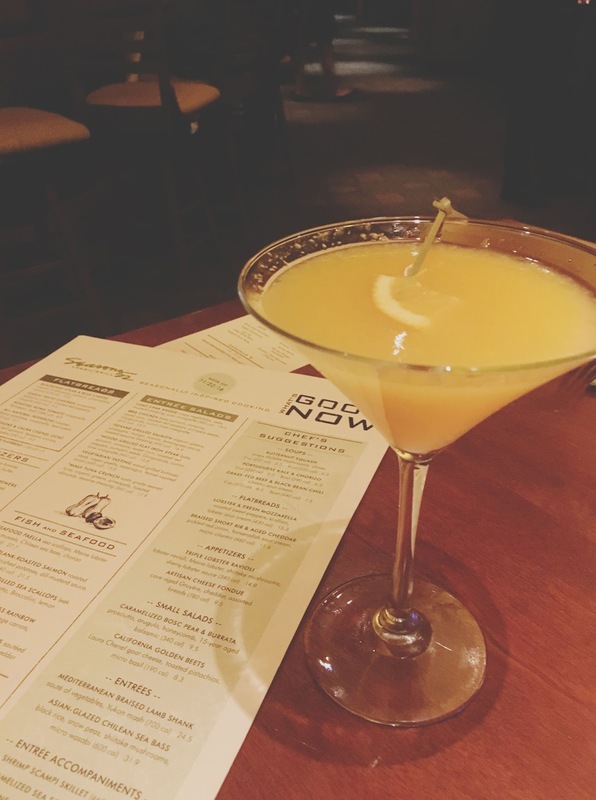 Feeling inspired, I kicked things off with one of their seasonal cocktails, the organic sunshine martini. Made with orange-infused prairie organic vodka and simple syrup, the basic drink was anything but! Sweet, bright, light, and smooth, it went down a little too easy - It really was sunshine in a drink! While I enjoyed it, I'm not a super sweet toothed person, so I opted for a glass of red wine as my second drink. Seasons 52 has an awesome wine list, and I always love investigating it! 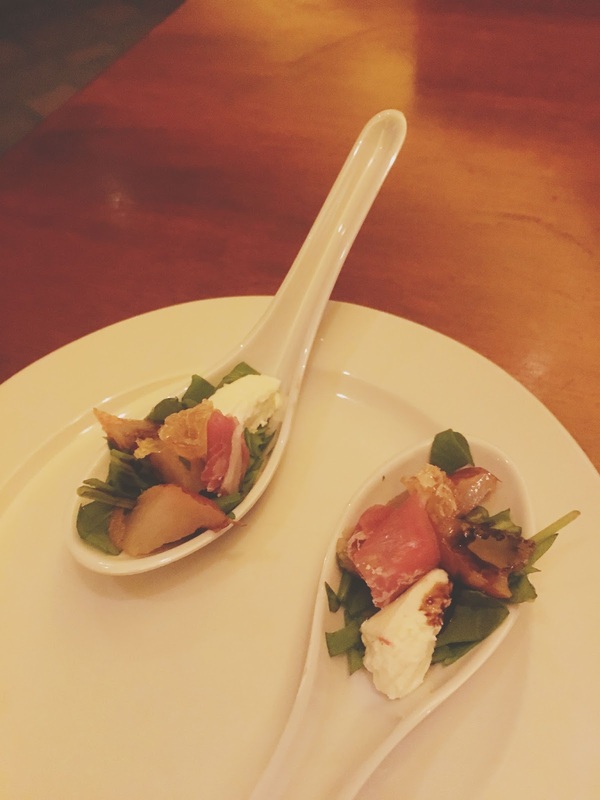 We were presented with an amuse bouche of prosciutto, goat cheese, and peaches, which Jon happily enjoyed for the both of us! Then we ordered a couple of appetizers, starting with the lobster & fresh mozzarella flatbread for Jon and the artichoke & Laura chenel goat cheese flatbread for me. Having previously had the lobster & fresh mozzarella flatbread, Jon knew he was going to love it again. I'd had a version of the artichoke flat bread before BUT it was back when I had my stint with veganism so IT HAD NO CHEESE. But this time? IT HAD CHEESE. And I'm telling you, the soft cheese cut very nicely through the tart balsamic coated veggies. 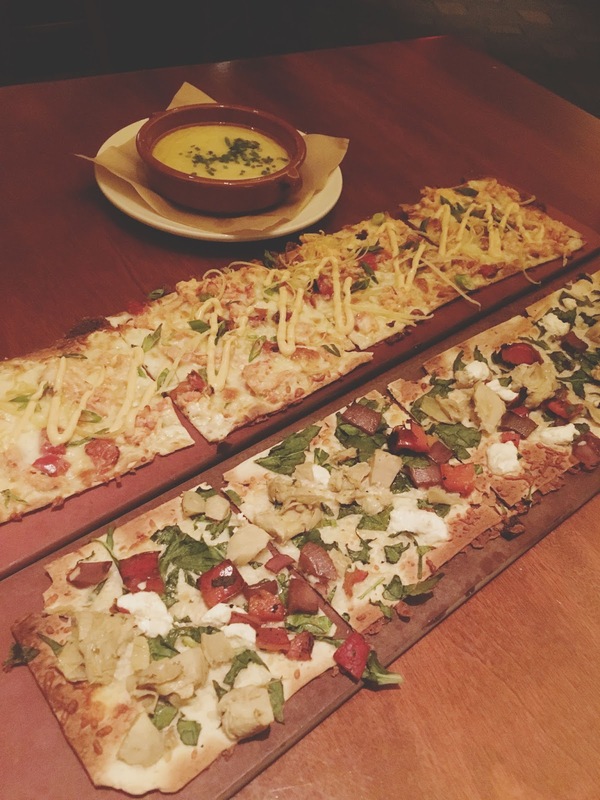 The flatbread itself was super light and crispy, and a great way to kick things off! We also ordered the artisan cheese fondue to split during this first round of food. A creamy, luscious combination of cave-aged gruyere and cheddar made this dreamy cheese dip one of my favorite two food items of the evening. The tangy, lovely cheese was made even more delicious when paired with an assortment of breads that offered varying tastes and textures to elevate it. This was one hella awesome fondue! Oh but this round of food was not over, folks, because we also ordered a side of their roasted brussels sprouts without bacon! Cooked in a 15-year aged balsamic, what I found most notable about these brussels sprouts were their ever-so-slightly crisped outer layer. The texture was great! I also ordered a side of truffle mac 'n cheese en brodo. I LOVE truffle, but I recognize how easy it is to mess it up. Throw too much in, and forget about it being palatable. Luckily for me, the restaurant could not have gotten this truffle mac more right! It had the perrrrfect amount of truffle oil, along with a rich swirl of gruyere and cheddar, all topped with a delightfully crunchy panko crust. This mac and cheese was DIVINE. For our main course of food, Jon ordered his favorite, the red snapper (what he always gets at the restaurant), and I went with the vegetarian tasting plate. I also always order the vegetarian tasting plate, however this one had completely different components in it than it did on my previous two visits. The plate consisted of a wood-grilled kohlrabi steak, asparagus, a fennel-roasted onion, and vegan paella. The kohlrabi and asparagus were fresh, standard, and good, and the fennel-roasted onion, was unique and surprisingly delightful (I don't hate fennel, but I generally don't lose my mind over it). But the vegan paella? OH THE VEGAN PAELLA. Y'all, I seriously ate chorizo that night. I mean I didn't really eat chorizo, of course, but I ATE CHORIZO. The vegan paella was hearty, earthy, spicy, textured, and insanely delicious, with vegetables and bits of some sort of fake chorizo thrown in there. This was my other favorite thing I ate that night, it was so incredible!! The restaurant then presented us with their beautiful display of teeny, adorable desserts. Jon opted for his usual, the pecan pie, and I went with the red velvet cake. Jon's was very good, but I adored my less sweet, richer, decadent red velvet much more. The cheesecake frosting was perfect, and there was a surprise little raspberry at the bottom! I love Seasons 52, which is why I keep going back. The restaurant offers incredible, seasonally appropriate food, as well as awesome service to boot. Houston is lucky to have multiple locations, and I can't wait to go back again!